These were the two quotes that kept floating unbidden to my mind at my first mediation class. It was a cold Sunday morning in February and I was sat cross-legged on a cushion in a small, white walled, intimate room with several strangers. I was looking up at our teacher, a doctor in two very different languages and cultures with one foot in the East and another in the West. She was writing on a white post-it note with a black marker pen. So the future is unwritten. The future is what we can have an impact upon. But first we need to learn to control our minds– the ‘wild wolf’ that lurks in our subconscious and drags us down unseen, twisting avenues. A spoon passed over the front of a white cup. A shadow fell on its glossy white surface. She told us that the mind is a mischievous monkey that doesn’t want to be tamed. The mind flits restlessly from one thing to another. Our eyes were closed, our right hands sitting cupped inside our left, thumbs touching so the energy could circulate around our bodies. Slow breaths in, slow breaths out. It was time to take the first three steps. Centre – With your eyes closed, focus on an internal spot. Or eyes open on a candle, or on the patterns water makes. The important thing is to find your still focus. Constant – Keep your attention at this spot. Breathe in and breathe out slowly. Count your breaths if that helps – but only go up to 10 and then return back to 1. Control – If you find your attention wandering, bring it back to the centre and keep it constant. There is no harm in your attention wandering as long as you bring it straight back to your chosen central point. ‘You should aim for 3 minutes a day for the first week. By the second week, try to build up to 5 minutes a day, ‘ our teacher told us. So, time will tell if our internal mind monkeys have begun to be tamed, whether we can all begin to find our still points in this constantly turning world. If you’re thinking of a career in e-learning but don’t know where to begin, have a look at this Creative Choices article. Written by e-learning and Multimedia Specialist Laura Taflinger, it features advice from a range of contributors – including me in my previous incarnation as Multiplatform Producer for the BBC Academy. Laura and I were part of the team who set up the Creative Choices website in 2007. Laura also edited many training videos for me while I was at the BBC Academy. 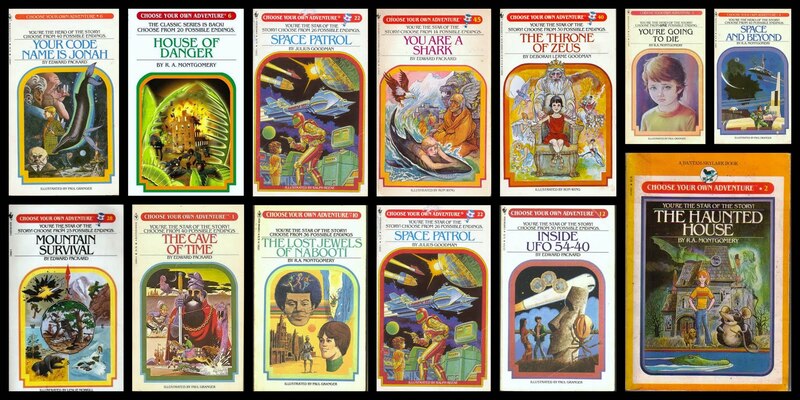 If, like me, you grew up in the 1980s, chances are you would have loved reading Choose Your Own Adventure books. You were right in the centre of the story – and actions you made had a direct impact on the narrative. There were many possible endings – many of them fatal! But eventually, you’d learn the correct path through the story. You can learn a lot risk-taking in a completely safe environment. Branching narratives are not only great for storytelling; they are great for learning too. We are all natural storytellers. If the learner is asked to take decisions rather than passively watching or reading a narrative, they are more likely to be engaged and thus absorb the information. A branching narrative can be a really useful learning tool for soft skills where there are no clear right and wrong answers. But producing branching narratives can be technically challenging and costly. The BBC Academy used Twine to produce a interactive pilot Choose your Own BBC Career. Below are some more examples of branching narratives. Take the Knife demonstrates one way of getting around the technical issues around video narrative by using You Tube– but the video still has to be produced many different ways so the cost factor could still remain. You can see why this was made a branching rather than linear narrative. The decisions are the users to make. It shows rather than tells. The user is an active participant taking responsibility for their actions rather than a passive observer. This was made by Kinection. It takes a very sensitive subject and plunges the user directly into a warzone. The choices they make will determine whether the mission is a success or not. They have to decide themselves what will be the best way to connect with Harj Kamal. Ahem. I am no poet laureate…but this commission for the Open University will help you find the right poem for your mood. It sits on the Open Learn platform – so after discovering your Poetry Prescription, you are in an ideal place for deeper learning on the subject. This project was developed by Chromatrope. US Interactive marketing company Jellyvision use a branching narrative technique to illustrate what their company is all about. Rather than just tell you straight off, they ask you to interact so you’re engaging with the company from the outset. This gives you much more of a sense of what the company is all about. Personally, I had the impression the company was fresh, slightly cheeky and creative. The BBC Academy today announced it has joined iTunes® U, the world’s largest online catalogue of free educational content from top schools and prominent libraries, museums and institutions, that helps educators create courses including lectures, assignments, books, quizzes and syllabi, and offers them to millions of iOS users around the world. The free iTunes U app, featuring courses, collections and educational resources, gives educators and students everything they need on their iPad®, iPhone® and iPod touch® to teach and take entire courses. With iTunes U, students and lifelong learners gain easy access to enriching educational content no matter where ideas are shared or interests are explored. The BBC Academy is the BBC’s training and development division. It puts training and development at the heart of the BBC and also works with the wider industry, equipping people with the skills they need for a lifetime of employability in the ever-changing media landscape. The BBC’s training and development division has a charter remit to train BBC staff and to help to train the wider industry. As part of a recent review and ahead of its relocation to Birmingham in 2015, The Academy has signalled that it will increasingly focus on digital delivery for much of its learning content. After a year of careful negotiations, the BBC Academy’s i Tunes U site goes live today – Monday 19th January – in the Beyond Campus section. It’s a very promising start to the week. The BBC Academy iTunes U site was one of the development projects I’ve been working on with external supplier Chromatrope. New content will be added every week and we will be watching with interest to see what we can learn from the statistics and feedback. The BBC Academy’s move to Birmingham in July 2015 has meant re-thinking what it can offer digitally. We have been exploring different freely available platforms to see how they might be used to provide more creative learning options. Our other projects are coming along very well and hopefully there will be some more news on them shortly.